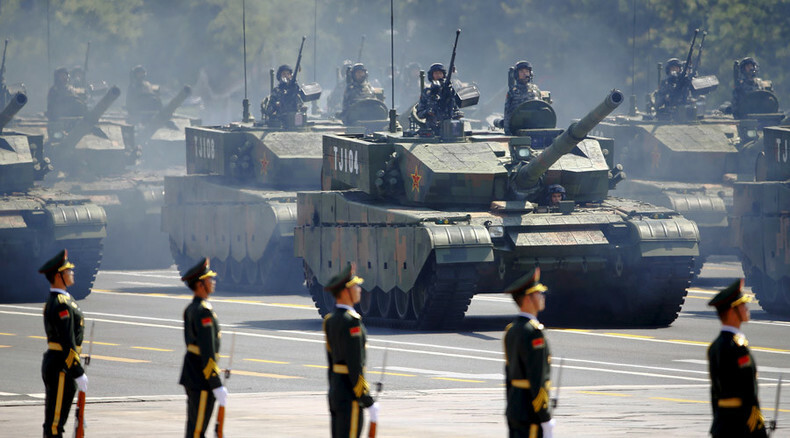 Celebrating the 70th anniversary of Japan’s capitulation in WWII, China has showcased hundreds of its newest military hardware in a remarkable parade which saw some 12,000 troops marching across Tiananmen Square in front of dozens of world leaders. Some 30 foreign leaders attended the memorial event, representing countries from Russia and Belarus, to Egypt, South Korea and Venezuela. The UN Secretary General Ban Ki-moon also attended the parade, while the majority of “high-profile” Western leaders have passed on the event. Over 200 Chinese aircraft, including fighter jets, bombers and dozens of helicopters, zoomed above the fascinated crowd.China has rolled out seven types of missiles on to Tiananmen Square, including four ballistic nuclear missiles. Among them was the Dong Feng-21D anti-aircraft-carrier medium-range nuclear missile (‘Carrier-Killer’), which currently is the world’s only ballistic missile capable of engaging a moving target out at sea. 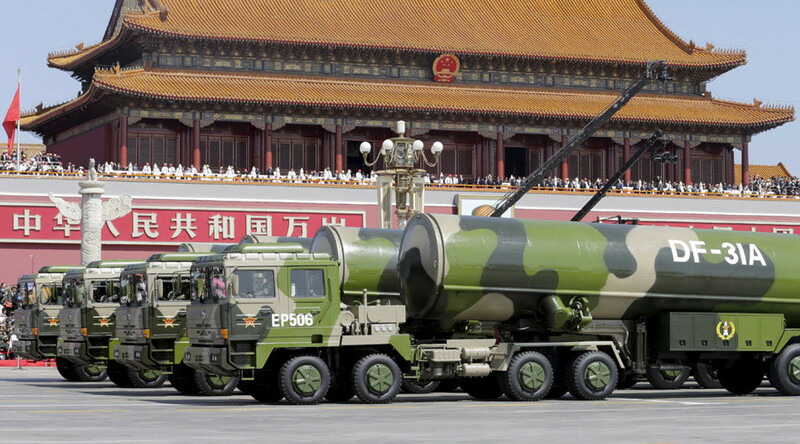 Beijing also demonstrated the Dong Feng-26 nuclear missile, a medium-range ballistic projectile prohibited in Russia and the US because of a bilateral agreement. This intermediate range ballistic missile (IRBM) was dubbed the "Guam killer" because it can reach the US Pacific Ocean base. 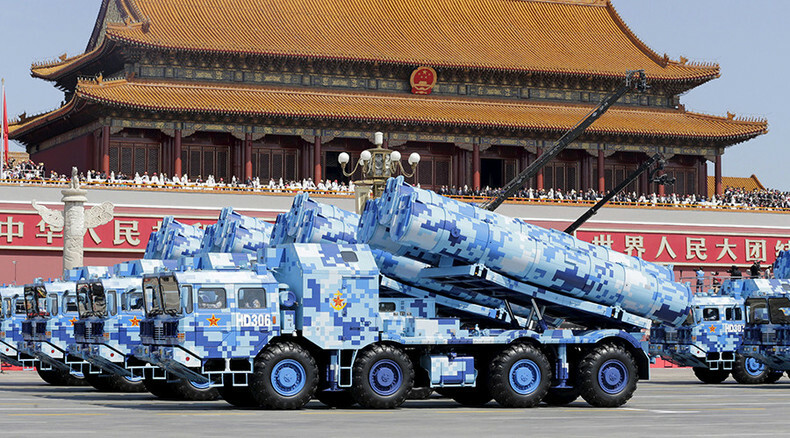 The PLA also presented its newest intercontinental strategic ballistic missiles, the DF-5 with a range of 12,000 kilometers and the DF-31A - range 8,000 kilometers. 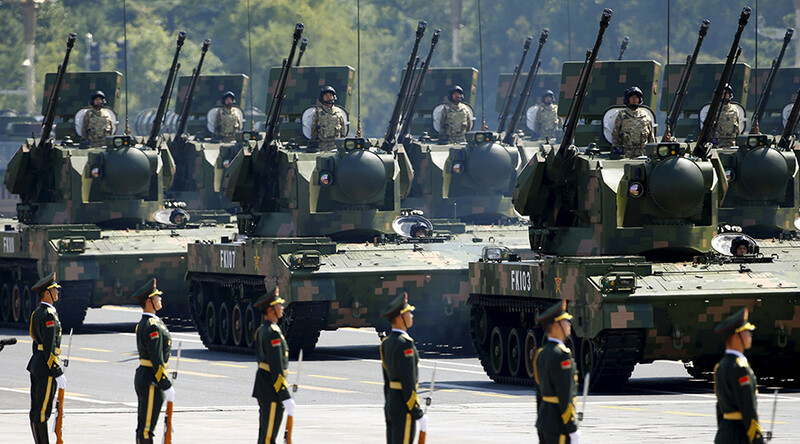 During an almost two-hour-long People's Liberation Army (PLA) parade, several hundred military vehicles of around 40 different types rolled across the square. The whole event was accompanied by an army orchestra and a 2,400-strong massed choir that sang some 30 songs. Chinese troops were not marching alone on the commemorative date: They were joined by their fellow soldiers from Belarus, Cuba, Egypt, Kazakhstan, Kyrgyzstan, Mexico, Mongolia, Pakistan, Serbia, Tajikistan and Russia. 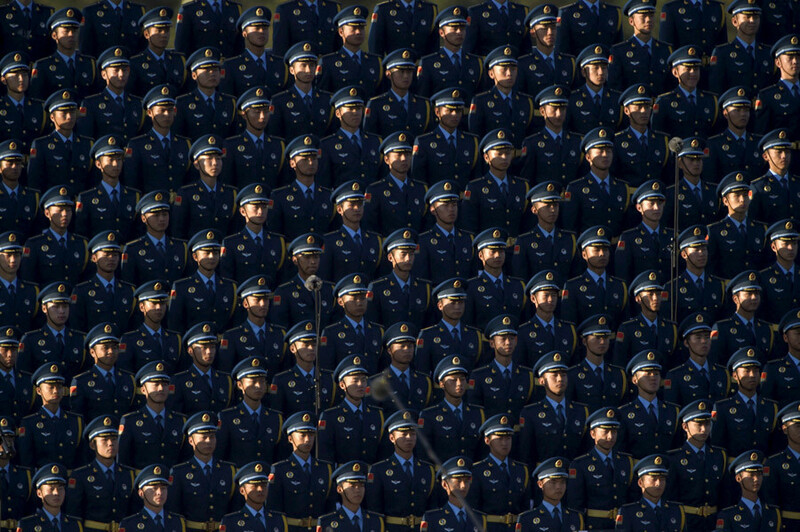 Additionally, for the first time in the history of Chinese parades, female soldiers marched on Tiananmen Square. Addressing the nation and guests prior to the show, President Xi Jinping reaffirmed China’s commitment to the path of peace. “Prejudice and discrimination, hatred and war can only cause disaster and pain,” Xi said, announcing plans to reduce the number of the country’s troops by 300,000, some 13 percent of the current 2.3-million strong PLA, as part of the country’s long-term military reform. "China will always uphold the path of peaceful development,” Xi said. Russian President Vladimir Putin, who took part in the celebratory events in Beijing on Thursday, said that the lessons of World War II should be remembered to minimize military conflicts around the world. During a meeting with Xi, he agreed with his counterpart that Russia and China are “united by a strategic relationship and, as we say, a comprehensive partnership,” adding “what is also important is the way we perceive historical problems." Russia and China should not forget "the cruel actions of invaders on the temporarily occupied territories, which resulted in innumerable victims." "But we must remember this to make sure that nothing like this happens again in the future. 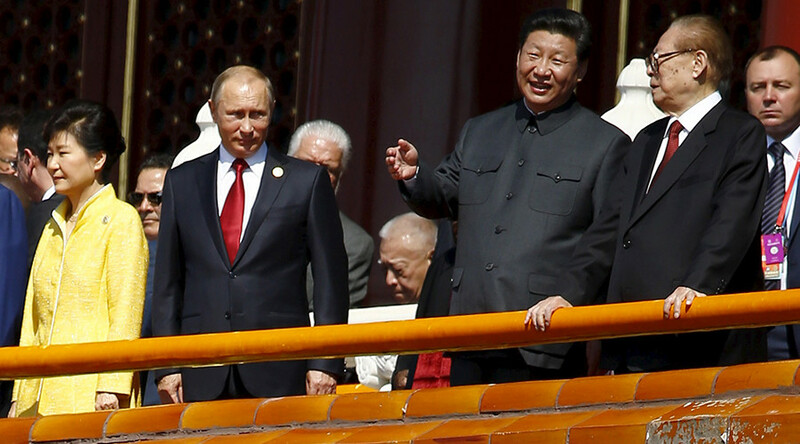 I listened carefully to your speech at the parade, I believe that was the main message of your speech addressed to the people of China and the peoples of the entire world, namely: everything must be done to prevent large-scale military conflicts in the future and to minimize military conflicts in general," Putin said. "During bilateral meetings today, we exchanged opinions, and we have full confidence that we will move forward consistently, develop our relations, implement our plans, including large projects which will definitely have a positive effect on the development of the Russian and Chinese economies, and the global economy as a whole," he said.